One of the indie world's first superstar developers made millions from one game. He's spent it all to make his next. Jonathan Blow's beautiful, distinct 2008 platformer Braid is largely regarded as the original indie game -- The Notorious OIG, if you will. Blow spent roughly $200,000 to create Braid and it made him a millionaire. Blow said in 2012 that he was funneling all of the money from Braid into his next project, a Myst-inspired puzzle game called The Witness that he's been working on since 2009. He wasn't kidding when he said all. "Braid still sells well on platforms that are thriving, but two of Braid's big platforms were the Xbox 360 and the PlayStation 3, both of which are sunsetting at this point," Blow tells me in an email interview. Braid was pivotal on Xbox 360. It launched as an exclusive on the digital storefront Xbox Live Arcade and ushered in a wave of successful independent games for the console. "Not so many people are buying digital games there," Blow says. "So the Braid income is not nearly enough anymore to fund the team. I have borrowed a bunch of money to finish The Witness. So I hope when it's done, some people buy the game." The current console generation kicked off in late 2013 with the launch of the PlayStation 4 and Xbox One, and these systems now dominate the market. Previous-generation games do sometimes make their way to new consoles; so far, Braid isn't one of them. It's still available for PC, Mac and Linux on digital distribution service Steam, where it's now six years old. Since starting development on The Witness in 2009, the game has at least tripled in size, from eight hours to 25-40 hours. The Witness dev team, nine people credited in full and eight additional contributors, hit a development milestone last month: All of the game's puzzles are complete. There's still plenty to work on, but the creative heavy lifting is done. There are 677 puzzles in The Witness currently. Blow generally keeps gameplay details vague for fear of spoiling The Witness' main focus, but he says there are 11 different puzzle areas, and to "beat" the game, players will need to solve seven or eight of these. Each section has a different number of puzzles, and some areas can be completed without solving every puzzle therein. "It's a pretty flexible game that way," Blow says. "But if you solve all the areas, of course, you might get a little something extra. Or a lot." The Witness' premise may sound familiar to some of you. Late last year, The Talos Principle launched on PC: a 3D, first-person puzzle game composed of separate puzzle areas and a mysterious, overarching story. The Witness is also a 3D, first-person puzzle game bathed in mystery, but Blow says it's a completely different experience. The Talos Principle, for instance, involves communication with a booming, god-like voice and others via computer terminals. The Witness is about the experience of being alone on an island, finding beauty in that solitude and solving puzzles along the way. 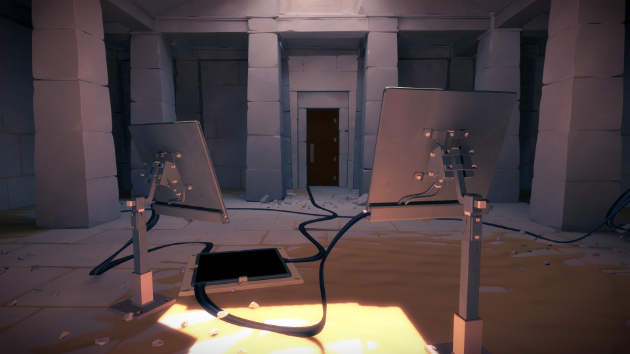 "There are some similarities between The Witness and Talos Principle, but most of those similarities are on the surface," he says. "I think these two games are ultimately about very different subjects, and were made for very different reasons, and you feel the differences when you play. That said, it is likely that someone interested in one game may be interested in the other game." Clearly, there's not a case of any developer "stealing" ideas from another, as Blow has been building The Witness for six years. That's a long time to tease fans, and Blow knows it. "If there is such a thing as taking 'too long,' we have probably already done that," he says. "20 years from now, I am not going to care about whether we took an extra six months or a year in development; I am going to care about the quality of the game people got to play. It'd be a shame to sacrifice some of that quality just to squeak the game out a little sooner. Though I do sympathize with people who have been waiting a long time to play."